I must give a hearty thanks to the Heritage Foundation for this article. I have been pursuing a better understanding of Fannie Mae subsidies ever since the Wall Street Journal published Katrina’s no-brainer idea that everyone should rally around the idea to tax the big banks to recoup the taxpayer-funded bailout. In an interesting twist of word meanings I agree with Katrina that taxing the big banks is no brain idea. It is difficult to understand how the average person finds the wisdom of picking a fight with commercial banks while we ignore the continuing financial disaster at Fannie Mae and Freddie Mac. So while the CBO and the Administration quietly debate when to recognize the increase in the national debt due to Fannie Mae and Freddie Mac and the Federal Reserve frets who will buy the mortgage backed security debt in April, the average person is presumed to be more interested in taxing banks rather than efforts to fix the biggest financial crisis of our generation. In his State of the Union address Wednesday night, President Obama repeated his call for a tax on banks, calling it “a modest fee to pay back the taxpayers who rescued them in their time of need.” That sounds good, everyone agrees the taxpayer’s money should be paid back. But there’s a bit of misdirection going on here. 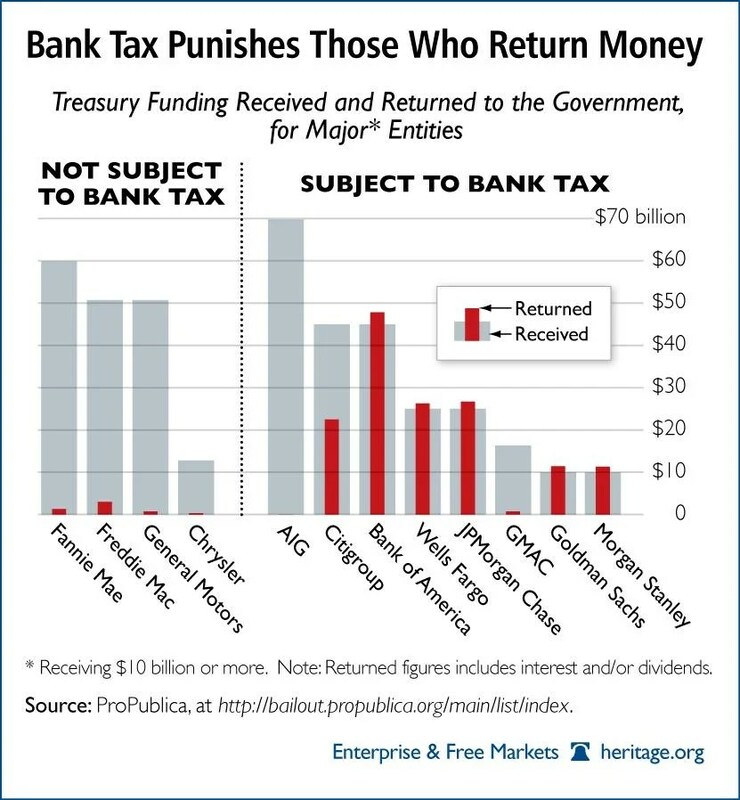 As shown in the chart above, most big banks have already paid back the government money they received, with interest. On the other hand, most of the big companies that still owe billions to taxpayers, including Fannie Mae and Freddie Mac, and auto firms GM and Chrysler would not be subject to the tax. Only two big firms, AIG and GMAC, owe the government and would pay the tax. Even in these cases, the “modest fee” won’t add anything to the government’s coffers ”” any taxes they pay would simply reduce the amount the amounts they pay back. The plan will do nothing to help taxpayers or get bailout money returned to the Treasury. It makes for good rhetoric ”” what politician doesn’t want to sound anti-bank nowadays? ”” but is no substitute for real policy.